The toddlers of Nursery, Witty World, Bhilwara went for a nature walk to Smriti Van on Thursday July 20' 2016. Children were excited to go to the garden.. They saw tall and short trees, colour ful flowers, insects, birds that live on the trees. 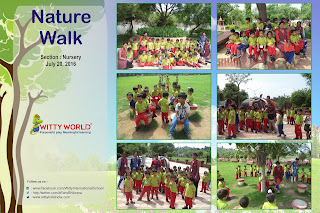 The kids played on the green grass, stood under the shade of tall trees .Children enjoyed the greenery and got the message that we should plant more trees as it gives shade and is a home of many birds and insects.